This product has been discontinued, supplies are limited. No replacement is listed at this time. Cisco 300 Series Switches deliver the ideal combination of price, performance, and capabilities in a solution designed specifically for small businesses. This broad portfolio of affordable, managed switches provide a powerful foundation to support your business network. Cisco 300 Series Switches offer: *High Performance and Reliability: Get the high availability and performance you need to support vital business applications while reducing downtime. *Advanced Features: Control network traffic with advanced features such as quality of service (QoS), Layer 3 static routing and IPv6 support. *Easy Setup and Management: Intuitive browser-based tools, mass deployment capabilities, and consistent features across all models simplify setup and configuration. *An Eco-Friendly Solution: Switches optimize power usage for energy efficiency without compromising performance. *Peace of Mind: All Cisco 300 Series Switches are protected for the life of the product by the Cisco Limited Lifetime Hardware Warranty, which includes next-business-day advance replacement. 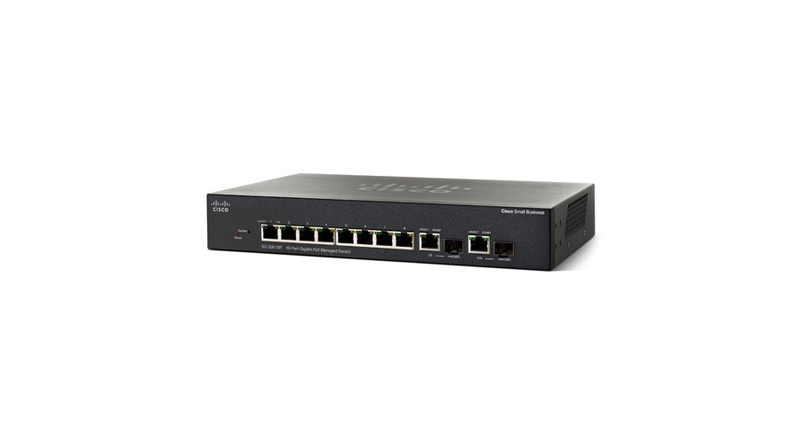 SG300-10P (SRW2008P-K9-NA) 10-port Gigabit PoE Managed Switch. 8PORT 10/100/1000 POE 2PORT COMBO MINI-GBIC This product replaces SRW2008P.